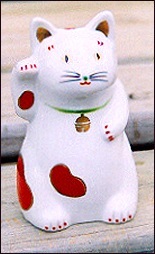 "Maneki Neko", as shown in Kanji characters above, is often translated as "Beckoning Cat". She beckons for many different things, including good fortune, money, long life, health, & even love. 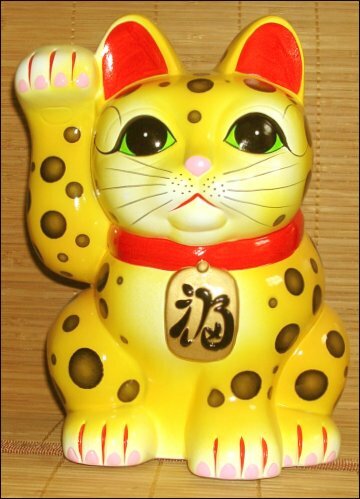 Besides "Beckoning Cat", she may also be called "Lucky Cat", "Good Fortune Cat", "Money Cat", "Happiness Cat", "Welcomer Cat", etc. (Even "Hello Kitty!") These names are used interchangeably within this website. Sometimes we simply call them Maneki's or Neko's. Or even MN's. "A rose by any other name ..."
***Note: "Maneki Neko" (Japanese) is pronounced "MA-neck-ee-NECK-o". Which Paw? 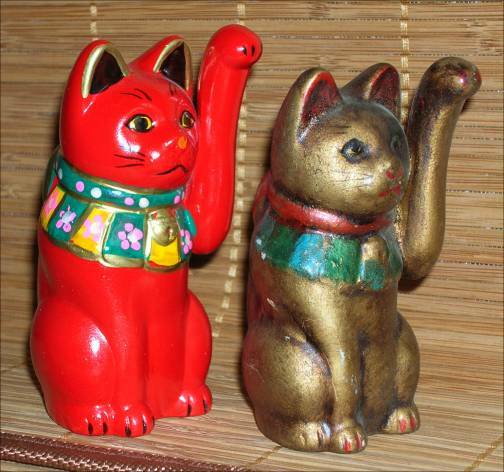 Per the Japanese Maneki Neko Club, a raised LEFT paw invites people or customers; a raised RIGHT paw invites wealth or good fortune. Does two paws up provide extra luck? Maybe. It should be noted here that there are many different interpretations of the left vs right raised paws. Right-handed. 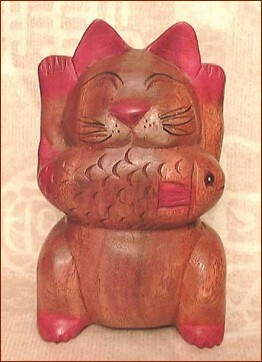 A toy bobblehead Maneki Neko. Very cute in white with black spots. Material: ceramic with spring, height: 3" (7 cm), id: Kanji on coin, price sticker on bottom, "JAPAN" inscribed on back. Left-handed. A molded "whitestone" okimono figure, painted with a fancy flowered vest & holding gold ingots. Very serene. Material: "whitestone"; height: 3" (7 cm), id: on the bottom - a red chop mark & a gold "MADE IN CHINA" sticker. Left-handed. 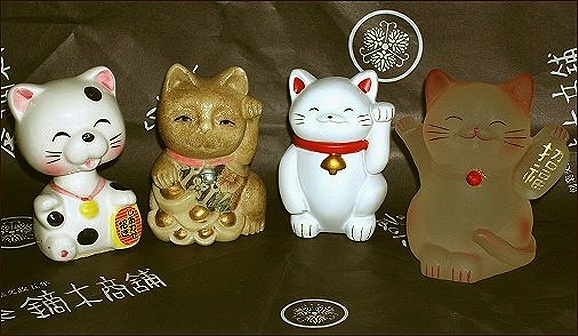 A simple white Maneki Neko that comes in a nice boxed set called "Lucky Cat: He Brings You Good Luck". He was specially designed for the set. The other pieces of the set are a stage for display & a small but excellent book by Laura Wellman. A product of Chronicle Books. Material: molded plastic; height: 2 3/4" (6.5 cm); id: none. Both paws up. A translucent Maneki Neko in shades of pink. A happy fellow with a coin that says "Beckoning for happiness & good-luck." Material: molded plastic; height: 3" (7 cm); id: none. A Lucky Cat from Thailand w/ both paws up! Lucky times two! He's carved from wood, decorated w/ red, black, & white; and has a small paper price sticker attached underneath. 6.25" (16 cm) tall. Purchased new from Hong Kong eBayer "Kailin". This small, very red Maneki came from Japan to Memphis by way of eBay. Apparently new, he wears a brightly colored bib & beckons with an amazingly long arm! Height 3 7/8" (9.5 cm). 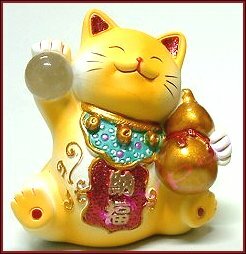 This long-armed, golden Lucky Cat appears to have been around a bit longer than his partner. Still, they are very much alike! He comes from Japan by way of Old Japan, Inc. He's made of porcelain; stands 3 1/2" (9cm); and his features are not quite as sharply molded as those of the red cat. 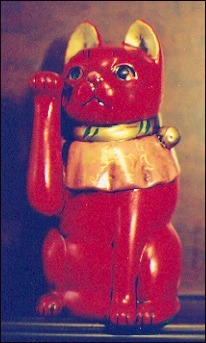 Low paw: A wonderful antique Lucky Cat (early 1900's? earlier?) from Singapore. As one of my friends would say, he's definitely a "treasure". He's porcelain w/ orange, sea-green, black, & gold decoration. 2 1/8" (5.2 cm) tall-wise & long-wise. 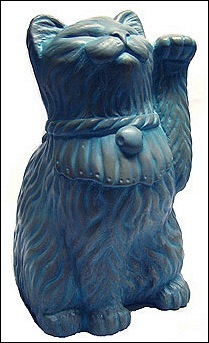 Raised right paw (note the height), round gold-painted bell in middle of ruffled collar, short curled tail, & 3 small holes in the base. [Those folks that decide stuff consider a small hole to be a sign of age.] No marks. What Color? 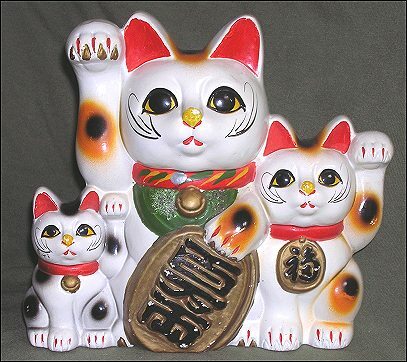 The most popular Maneki Nekos are TRI-COLORS (calicos), often taking the form of the Japanese Bobtail, called "Mi-ke". They are said to attract good fortune & prosperity. 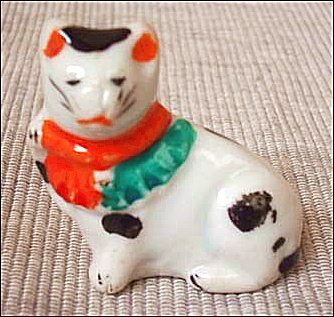 The more traditional tricolor lucky cat figurines have spots of black on brown; but nowadays other color combinations may be seen. Here's Mr. 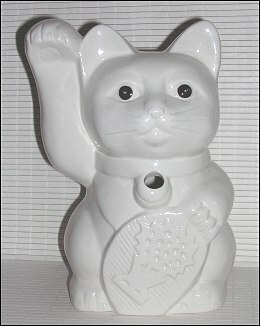 Timid, a fanciful white porcelain Maneki Neko. Note that his spots are bright red outlined in gold. A much more contemporary style than the Tokoname above. He's 5" (12.5 cm) tall and was purchased from a Japanese eBayer. I like this meek little guy a lot! WHITE cats beckon for purity & creativity. [Per Feng Shui, they may also be associated with children.] 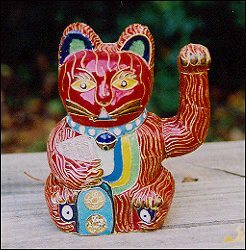 The Japanese Maneki Neko club suspects that white manekinekos are really tricolors without spots, due to the manufacturer's laziness or attempt to save money. This particular pair of white Lucky Cats may be considered "Tiki-Mug style". 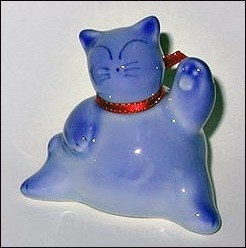 A traditional style ceramic Neko from a Japanese eBayer, 2005. It's the widespread red ears that attracted my attention. Don't know his age, but he looks as though he's been around a while. 7.25" (18 cm) tall. He's wearing a "fuku" medallion. GOLD cats bring money & wealth. 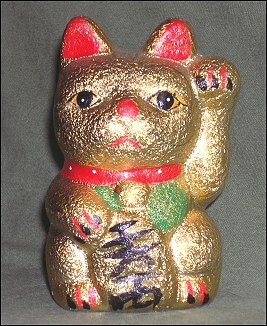 A slightly sad-looking, textured-gold ceramic Fortune Cat who is also a bank. Height 4.25" (11 cm). A pre-owned 69-cent rescue from my neighborhood thrift-store. He holds an ancient gold coin called a "koban", which shows the characters for "10,000,000 ryo" (meaning "Lots of Money"). 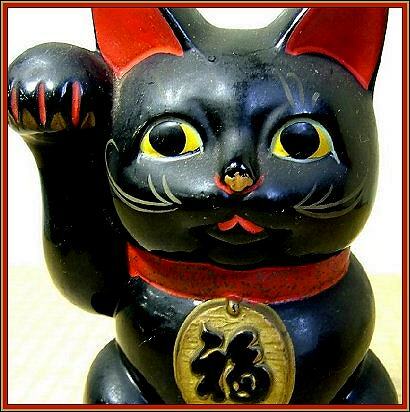 This style of beckoning cat is called "Tokoname", after the Japanese region associated with it. Note: Most golden cats will be Toko's because they're the best known & most popular MN's. 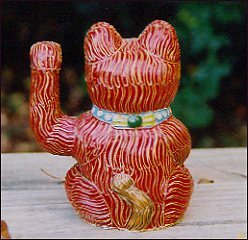 A red cloisonné Beckoning Cat from Mainland China. Height: 6" (15 cm). Material: enameled thin metal (copper?). He appears to be holding an abacus in his right hand & to have a couple of Chinese coins on a shield beside his right foot. Note: There are two types of "cloisonné" decoration. One, this kind, consists of wire forms laid onto a metal surface & filled with enamel. The other, in which material is removed from a metal surface & replaced with enamel, is not this one. 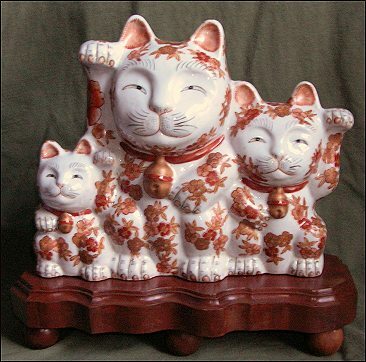 A beautiful reproduction of an olde Seto-style Maneki Neko. 10" (25 cm) tall; painted ceramic. 1 of 3 ordered from Japan by a member of our Yahoo-based "manekinekocollectors" group, "manekinekocollectors". 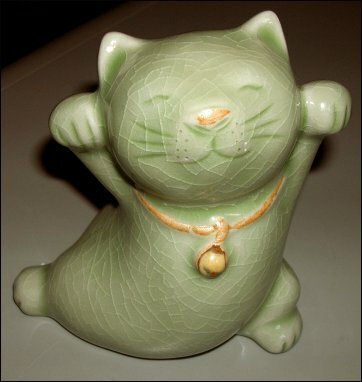 A waltzing Lucky Cat with a crackly green celadon glaze. Made in Thailand and sold thru Novica (on eBay). They come in pairs -- The right-handed one now brightens up my Mom's house. A beautifully executed, whimsical design. Note that the nose, collar, & bell are covered with a contrasting tan-colored glaze. Height 4 1/4"; ceramic; & has "MADE IN THAILAND" impressed into the bottom. There are other markings which I can't make out. An unusually-shaped "Tobe Kitty" from the "Cherry Blossom Pagoda" website. The blue glaze is attractive & the shiny red ribbon is a really nice touch. Ceramic, 2.25" (5.5 cm) tall, w/ both a black chop stamp & a round white sticker w/ Japanese chars (& "JAPAN") underneath. A Christmas present from sister Sue & her family. A big guy from the TyberKatz "East Asian Garden Collection". Cast stone with a blue patina finish. 11.25" (29 cm). ID: "(c)" followed by the artists' mark / "2003" scratched inside. Made in America by Pat & Peter Tyber. A gift from best-friends Barbara & Larry of "Home2Cats" rescue shelter, here in Memphis. Now owned by my housecats who use it as a stepping-stone up to the top of the closet door. One of my bestest feel-goodest cats! Everything about this guy says "Don't Worry, Be Happy!". He's bright yellow (for "wealth") with colorful detailing, holds a crystal ball (a symbol for "purity") & also a lucky gourd (for "longevity"). His smile & body language are right on. 2.5" (6.5 cm) tall, he's painted ceramic. ID: Embossed in an oval beside his tail is "Kao / Miao Chuang". Purchased new from Taiwan. These little guys were formerly key-chains, but I've removed the hardware. They're made of molded plastic & are almost an inch tall. One is gold, the other pink. The pink one, "love," is holding a valentine heart. [A case of an Asian designer utilizing a Western symbol.] 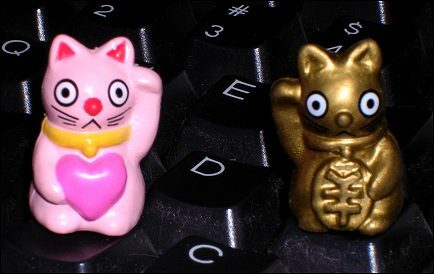 These Nekos are from Micha, a fellow MN collector/artist who sold me the pink one & gave me the gold. HAPPY NEW YEAR! 2006! - The Year of the Dog! My first Maneki Neko for this year was a gift from Dr. Carolyn M. to my wife, Bren. It's a trio of Lucky Beckoners with unusual eyes - decorated with brown, rust, & gold flowers. Gray ceramic, 8.5" (21.5 cm) tall. It's been custom-mounted on a carved wooden base. 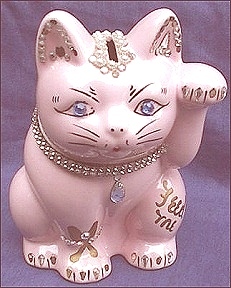 A handmade Maneki Neko with a dollar-sign money bag. He goes all the way, beckoning in the American style with his palm facing backwards. Beautiful work. Made of nicely glazed ceramic, standing 4.25" (11cm) high, & marked with a small, round, embossed cat face at the base of his tail. From an Arizona seller. 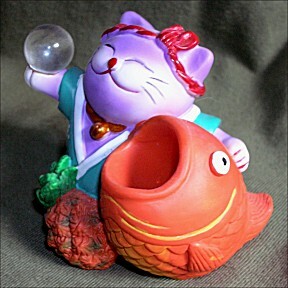 A small Lucky Cat with a big Lucky Tai Fish. They both seem happy, so i guess there's nothing to worry about. But the cat may have a problem if he doesn't feed his fish pretty soon, lol! I'd suggest a mouth full of toothpicks, methinx. Anyway, he's about 3" (7cm) tall, height-wise, and he's painted ceramic, material-wise.